Being told you can’t hold your newborn baby, or that you can’t even pick her up when she cries, is heartbreaking. But this is what Rachael Hibbert and her partner, Ryan Gifoli, were faced with when their two-month- old daughter, Chloe, was diagnosed with osteogenesis imperfecta – brittle bone disease. With multiple fractures to her arms and spine, Chloe had to lie on a tea tray – a makeshift bed the nurses made so that she could be carried around and so that Rachael could still breastfeed. Apart from the fact that Chloe had been born at 35 weeks and had jaundice for a while – which is not that unusual in premature babies – she seemed healthy and the couple had no causes for alarm. But then at two months, in February 2011, Rachael noticed that Chloe wasn’t moving her left arm properly. The results of an MRI scan were sent to Great Ormond Street Hospital (GOSH) and the couple were told Chloe had brittle bone disease. From nine months old, Chloe was given a bisphosphonate infusion intravenously every six weeks over a three-day period, to help the bone to form more solidly, though it can’t prevent the fractures. In the years that followed, she endured numerous fractures – particularly to her left arm, which is weak and bowed but unable to be corrected by surgery as it is too thin. Despite her condition, just after her second birthday, Chloe began to stand and learnt to walk. To help reduce injuries she was likely to pick up from being active, Chloe began using a wheelchair at three and a half. She also started nursery then, followed by school at four, where she received one-to-one support. Chloe’s occupational therapist at GOSH suggested the family contact the Brittle Bone Society to request a lighter one. Following their application, they were subsequently put in touch with my AFK – a charity which helps disabled children and young people to live independent and fulfilling lives. of jelly for sponsorship from friends and family,” explains Rachael. 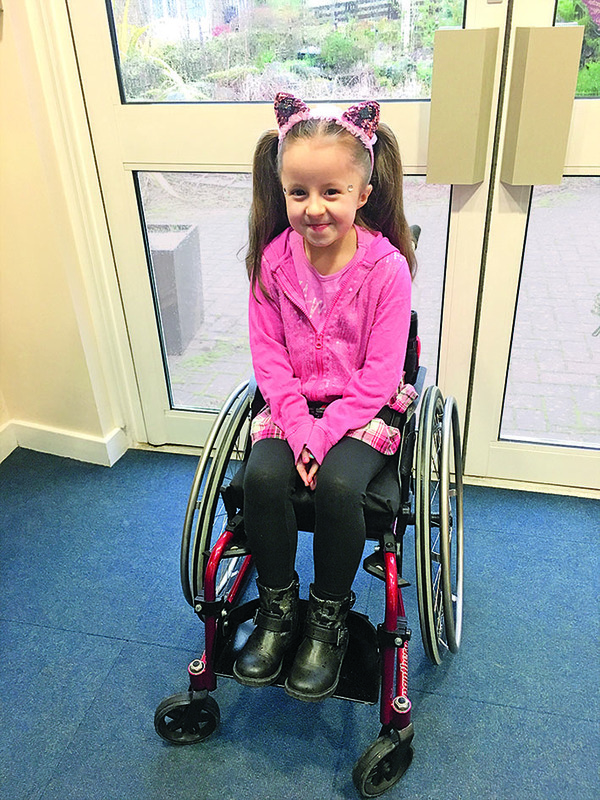 “They told us that a family who wanted to donate a sum of money to help a child with their mobility had heard about Chloe and offered over £1,000 to add to the £500 to buy a self-propelled chair. “We received the chair on 10 December last year and the next day was her school Christmas disco. She was over the moon to be on the dance floor with her friends, without anyone needing to push her around. It was very emotional to watch. Chloe is currently on another bone-strengthening drug called zoledronate, which she takes intravenously one day every six months. She has also since been diagnosed with dentinogenesis imperfecta, which is a tooth development disorder that is associated with brittle bone disease, which means her teeth are translucent and don’t grow properly, so she has to visit a specialist dental clinic in London every six months for check-ups. ➸ Funds raised in The Candis Big Give will be used to help the charity to provide one disabled child or young person every week in 2019 with the mobility equipment they need to gain maximum independence and make the most of their lives. What it does: Funds vital research into cancer and its treatment. Candis Big Give project: To find new ways of tackling cancer through the charity’s Pioneer Award. What it does: Partners people with disabilities with assistance dogs. Candis Big Give project: To increase the number of dogs and raise money for the breeding programme, training and kennels. What it does: Helps children with complex physical disabilities. To offer access to Eyegaze technology and buy 20 devices to allow children to use computers and interact with the world around them. What it does: Supports those affected by childhood cancer. Candis Big Give project: To develop the charity’s ROCK project. What it does: Raises funds for 30,000 patients each year at The Clatterbridge Cancer Centre. Candis Big Give project: Money raised will go towards a bone marrow transplant suite at its new cancer hospital in Liverpool. when a baby dies unexpectedly. Candis Big Give project: To help the charity to support families with a range of services. 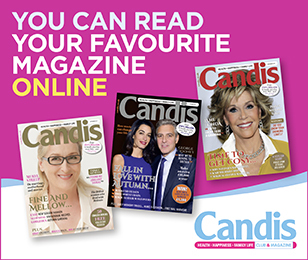 In 2019, Candis Club will donate at least £250,000 from members’ magazine subscription revenue to health charities taking part in The Candis Big Give. Any additional funds will go to charities at the discretion of the General Committee of Candis Club.